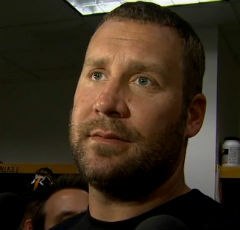 Big Ben met with journalists and reporters today before practice. Among the topics he was asked about was his bye, the Jets defense and Coach Rex Ryan, the mood in the Steelers locker room, his injured finger, the offensive line changes, and teammate Ryan Clark’s comments on ESPN’s “First Take”. Did a week off help? Yeah. It was nice to kind of get away and forget about football for a little bit. Kind of recharge the battery. Did you have a chance to watch the Jets Monday? A little bit, until I fell asleep. I watched a really good team go down to a tough place to play against, what I think, is a good Falcons’ team and good Falcons’ offense. The Jets’ defense is very good. It reminds you a lot of a defense that I’ve played a lot against, ours and the old Baltimore. Mixing things around, showing all kinds of different looks, blitzing, just anything you can draw up. Coach Ryan is a very intelligent defensive coach, and sometimes you look at things and you’re like, “Did he just draw that up, literally on the sidelines?” He’s that good. They’re ranked number-two for a reason. Are they also a group that can overpower you? Oh yeah. It’s not just finesse and confusion. I think it is finesse, confusion and power. I think they have a bunch of different things that can get to an offense, and that’s what makes them so talented. Not a lot of teams put 10-11 defenders across the line of scrimmage. Do you almost welcome that? If they’re going to leave the deep part open, do you sense opportunity there? If you have time to get it off. That’s the issue you come across when you see a zero-blitz and everyone is up, and everyone is going. It’s not easy. If you can just get a little bit of time and get the ball off, you’re good. But the key is blocking it up and giving yourself just a second of time. Do you look at the standings and think that you are still kind of in this? Not really. For us, it’s about breaking the season down into quarters and the first quarter is over. It didn’t end the way we wanted it to but we had a bye week. Hopefully we rejuvenate and get ready to go back at it. Does it make a difference that no one in the division is 4-0 or 5-0? We know where we’re at and that’s what is more important. We know that we’re behind everybody else and we’re playing catch-up. Do you worry about guys losing focus when things aren’t going right? No. I don’t think that guys in this locker room would allow it to happen, and I don’t think that anyone that puts on the black and gold from way back in the day until now has ever allowed it to happen, because it starts at the top with us. From the owners, the coaches and the players, it’s just not the way it happens around here. You always stay focused. You always think you’re in every game and every season until the end. You seemed to throw the ball pretty well on Monday. Does your finger feel alright? It hurt a little bit when I threw, but it’s just a finger. I’ve had worse [Laughs]. Ryan Clark said over the weekend that he thought you needed to tone down the improvisation because he thought it was creating too many turnovers and too many sacks. Is that him just trying to say something on ESPN or do you really take something out of that? I didn’t hear about it. It is what it is. I’m just going to play the game the way that I play it and try not to turn it over. Do you appreciate a teammate saying that? That’s the great thing about this country we live in. Everyone is entitled to their opinion and allowed to say what they want. If Ryan feels that way, then that’s fine. You just have to trust in the group and the individual. I’ll always have faith in those guys up front, whether it’s wide receivers or linemen. You have to trust with the work that they put in that they’re going to be focused and ready, and that they’re going to give it everything they’ve got, either to protect you or make a play for you. I think it’s more important for those guys up front, Ramon Foster, or whoever is a left guard or at center. I would like to know before Sunday morning, but you have to have faith in whoever is out there. Whether it’s Kelvin Beachum, Levi, Mike Adams, whoever it is, you have to have faith. And I have that faith in whoever it is. You can see & hear more from his interview here.